Step 1: Searching for the latest used phone, looking to buy second hand phone - Search for the second hand phone or second hand tablet in the search bar at the top of the page. Or click tab of interest being Mobile phones, Tablets, Smart Watches, or accessories. If Mobile phones or Tablets is selected the page will now show a variety of brands where you will select the one of interest. 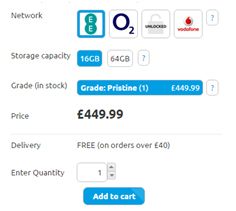 Step 2: The product page has loaded; all second hand phones or second hand tablets relevant have appeared in the search results. Find the desired second hand phone or tablet in the search results and click on the product to open the product page. Step 3: The chosen second hand phone or second hand tablet product page is now open. The desired Network (UNLocked, O2, EE etc.) if applicable has to be selected by clicking the desired network. The desired storage capacity also has to be selected by clicking the desired amount. The desired grade then has to be selected (Pristine, Excellent, Good, Acceptable, Refurbished, or new). The quantity if more than one needs to be entered. Lastly add to cart. Step 4: A special offers page has now loaded with 50% of all accessories. If an accessory is of interest select to view this product and add to cart. After selecting the accessory click the shopping cart which is located at the top right hand side of the screen. If an accessory is not selected click the tab saying go to checkout. Step 5: The shopping cart page has now loaded. Firstly select the shipping Country, if the shipping country is United Kingdom selected the desired shipping option (Free, Saturday, or Sunday). If applicable enter your coupon code. Navigate to the bottom of the page and either select ‘complete checkout’ or ‘PayPal checkout’. Step 6: If ‘complete checkout’ is selected a new page has loaded. Order comments can now be left if instructions are needed. Billing and Shipping information also needs to be completed then continue to the next step. You can now review your order and proceed to the next step via SagePay payment. The desired payment method now has to be selected (Visa, Visa Debit, Mastercard etc.). The next page will load after the correct method is selected. Card details now need to be entered and then ‘confirm card details’ needs to be clicked. The payment will then be verified and the order will be confirmed. If ‘PayPal’ checkout is selected the PayPal page has loaded and your login details need to be entered, then click log in. You are now logged in; card details and delivery address need to be confirmed. You now will proceed to payment and your order will be confirmed. Step 7: Congratulations! You have now placed an order for a used second hand phone or second hand tablet which will arrive the next day or on the weekend if selected! 4gadgets.co.uk, the place on the web to buy second hand phone.